Florida Central College campus. Photo courtesy of the State Archives of Florida. Central Florida is known as “The Theme Park Capital of the World”, but did you know that one of America’s most famous architects designed a college campus there? 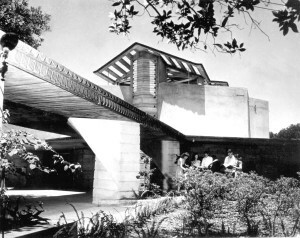 Florida Southern College in Lakeland, Florida is home to the largest collection of buildings designed by celebrated architect Frank Lloyd Wright. In 1938, college president Dr. Ludd Spivey commissioned Wright to design the campus. Wright accepted the challenge and drew up a master plan, naming his design “Child of the Sun.” This complex of 18 buildings was constructed around a central extravagant fountain dubbed the “Water dome” and linked by a network of sheltered esplanades. Wright designed and built the campus over a 20-year period from the 1930s to the 1950s. 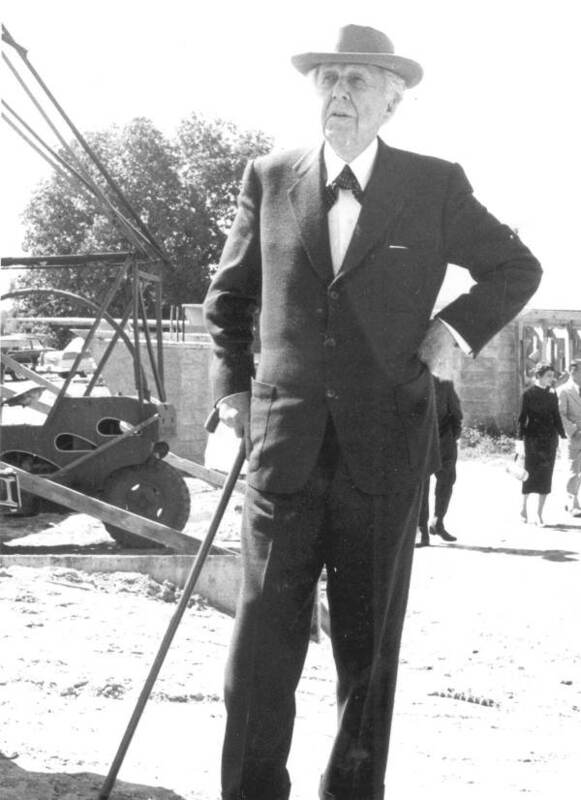 Frank Lloyd Wright at Florida Southern College. Photo courtesy of the State Archives of Florida. Portions of the school were mostly built by Florida Southern students, many of whom worked as laborers in exchange for college tuition. Students used Wright’s signature method “Textile blocks” to assemble the school. Ornate precast interlocking concrete blocks where assembled together creating various structures throughout the campus. Unfortunately, the buildings have not aged well. Over time, moisture has seeped through the blocks and many of the three-foot-long cast concrete textile blocks are crumbling. In 2007, “Child of the Sun” was added to the World Monument Fund’s 100 most endangered sites. The collapsing structures proved to be quite a challenge for restoration architect Jeff Baker, of Mesick Cohen Wilson Baker Architects. In order to save the buildings Jeff Baker is utilizing 3-D printing technology to recreate the textile blocks. New molds based on Wright’s original designs were recreated at Baker’s workshop from 3-D printed elements and handmade parts. This entry was posted on Friday, October 30th, 2015 at 4:04 pm and is filed under Architects, Preservation, Uncategorized, Videos. You can follow any responses to this entry through the RSS 2.0 feed. Both comments and pings are currently closed.